Abstract: Manufacturing supply chains (MSC) are large-scale distribution networks in which multiple types of commodities are present. 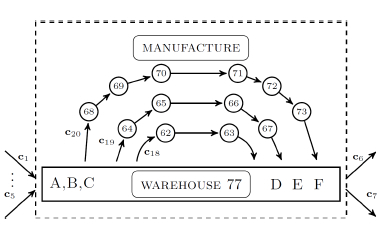 In this paper, operations management in manufacturing supply chains is stated as a tracking control problem: inventory levels at the network should follow desired values over time. A cooperative multi-agent Model Predictive Control (MPC) scheme for operations management in manufacturing supply chains is proposed. The MSC is decomposed into subsystems using a flow decomposition. Two different types of subsystems are possible, transport subsystems for physical connections or production subsystems for manufacturing goods. A control agent is assigned to each subsystem for operations management. Control agents solve their problems in a so-called pullflow perspective, starting at the end nodes and propagating upstream. Contracted commodity sets per control agent are proposed to limit the computational burden when a subset of the available commodities are handled at a subsystem. The multi-agent MPC performance is illustrated using a MSC composed of suppliers, a plant, retail centers, and end nodes using different prediction policies for commodity demands. The prediction ability of each control agent can be used to keep the inventory levels at the end nodes constant over time and guarantee cooperation between all control agents. Reference: J.L. Nabais, R.R. Negenborn, R. Carmona Benitez, M. Ayala Botto. A multi-agent MPC scheme for vertically integrated manufacturing supply chains. In Proceedings of the IFAC 6th International Conference on Management and Control of Production and Logistics (IFAC MCPL 2013), Fortaleza, Brazil, September 2013.